With the NPSL’s Founders Cup taking place later this year and representing the bridge for several clubs from an amateur or semi-professional status to a truly professional one, a major question for clubs was how they would, or wouldn’t pursue professional level coaching. For some clubs, especially the former-NASL clubs, the path seemed somewhat clear as they already had coaches with that history, but for others the fog is only beginning to clear. We can begin to find our answers in the recent hiring of two new head coaches for two of the Founders Cup’s clubs, the Milwaukee Torrent and Detroit City FC, both of which play in the NPSL Midwest Great Lakes conference. Detroit City called Ben Pirmann coach for six seasons, seasons that saw the club win conference and regional titles, play clubs from across the planet, and become one of the NPSL’s biggest names. While Pirmann’s legacy at the amateur level is about robust as it comes, he will not be leading the club into the professional realm after leaving to become an assistant coach for Memphis 901 FC, a new USL Championship franchise set to play in 2019. With a key leadership position open for business, City announced Trevor James as its new head coach on January 4th. On top of a playing career, James has an extensive list of credentials in various staff and freelance positions, working with the legendary Sir Bobby Robson as a scout for towards a decade before becoming an assistant coach for the Los Angeles Galaxy. He would hold that position, along with other duties with the Galaxy, for four years before moving to the Portland Timbers where he was assistant head coach from 2010 to 2012. James also worked as Director of Scouting and Assistant Technical Director for the Chicago Fire and coached with the Indy Eleven in 2017. From scouting for Barcelona, Newcastle, and Porto, to coaching top clubs in the professional tiers of the United States, to say Trevor James is an experienced individual would be an immense understatement. The question will be if James can lead Detroit City to a big result in the 2019 NPSL Great Lakes season and the Founders Cup. City finished in fourth last season, low for their historical standards, and will surely hope to return to the top of their conference. At the same time, the club faces a cup campaign that will pit them against two former NASL titans, the Cosmos and Miami FC, along with other top NPSL clubs like Miami United and Chattanooga FC. Doing well in the tournament would provide Detroit with a brilliant start to the next stage in their history. 2018 was Detroit’s year in many ways, but a successful upgrade with James could leave Detroit the undisputed champions of 2019. 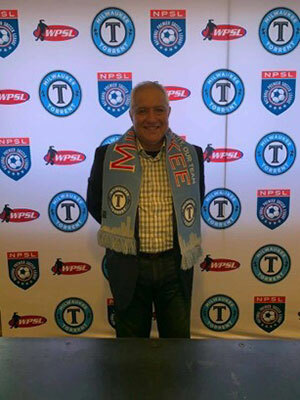 The Milwaukee Torrent also added their already-professional organization with the hiring of Carlos Cordoba as Head Coach for the 2019 season, which will see them play in the Founders Cup but not the NPSL Great Lakes conference. Cordoba has a strong record on and off the ball, spending nine years as a left back for Boca Juniors before making the move to management. Cordoba first managed as an assistant coach for the Dallas Burn (now known as FC Dallas) before spending a year as manager of the Miami Fusion, a now-past MLS franchise. The Fusion finished fourth in the East and made it to the conference semi-finals and Open Cup quarterfinals during Cordoba’s tenure. Cordoba would begin a career in Wisconsin while managing the Milwaukee Rampage, a former pro-club that played in the A-League from 1993 to 2002. Cordoba has also served as Technical Director for Strike F.C., a position he will continue to hold. Between the Rampage and Strike F.C., Cordoba’s career has included time with the Colorado Storm, Dallas Texans, UW Whitewater, the San Diego Hornets, and clubs like Chivas and Tecos FC. Needless to say, the Torrent have recruited an immensely experienced man to lead their new endeavor into the experiment that is the NPLS’s Founders Cup. The club’s time in the NPSL has been a challenging stint, including their second-to-last Great Lakes conference finishes in 2017 and 2018. With no regular season to worry about in 2019, Cordoba has been presented a chance to lead the Torrent to a level of success the club has yet to achieve. Both Milwaukee and Detroit have made serious and professional signings when it comes to who will be guiding their squads from the side line. Both James and Cordoba have made things work at the professional level and will have an eye for what makes a player special, both from playing in historic sides like Maradona’s Boca like Cordoba and through scouting for the great clubs of the world like James. The Founders Cup is a tournament surrounded in mystery, even by those entrenched in following the NPSL both in the past and present, but the slow coming together of a set of professional leaders for its clubs allows us to begin to form expectations for the cup’s nature and execution. Many questions remain. How will both clubs’ rosters reflect this new level of professionalism? How will Detroit manage its regular season while preparing for the Founders Cup? Milwaukee and Detroit have begun to show us the near-future of the NPSL. It surely, however, is just the tip of the iceberg.